Home / Tech Talk > What is Projection Mapping? Projection mapping is the projection of video, animation, and other colorful displays onto three-dimensional surfaces. Projection mapping can be used on a wide scale of applications - from projecting virtual clothing onto mannequins, changing the design and color on a pair of white shoes to projecting images onto wedding cakes. It can also transform the entire ambiance of a large venue such as a sports stadium or concert hall, and can even be used on the outside surface of buildings. Once available for only big-budget productions, recent advances in projector technology deliver affordable, bright, high-quality, high-lumens projection that is within the reach of virtually any venue owner or manager. Disney pioneered the use of projection on three dimensional objects in its Haunted Mansion display at Disneyland in 1969. Plaster busts of the "deceased" came to life, talking and singing to amazed onlookers. However, the high-cost of producing these effects kept the technology out of the mainstream until the advent of more affordable high-lumens projectors. Unlike other light show technologies, projection mapping offers venues wide-spread creativity in using light in small or large environments. Driven by a new, affordable generation of projectors, mapping can completely cover irregular shapes, objects, and even entire building facades. Immersion: Projection can map an entire venue, enveloping the audience in an image and color-rich environment that transforms the ordinary into the extraordinary. Impact: Story, flowing images and animation can create a greater emotional impact than static slide shows or music alone. Motivation: Greater emotional impact leads to motivation-whether it's to get up and dance, consider a product purchase, or join the crowd in cheering on a sports team. Setting tone: Light influences mood. Projection mapping can extend the mood-altering properties of light into a more focused and shared experience. 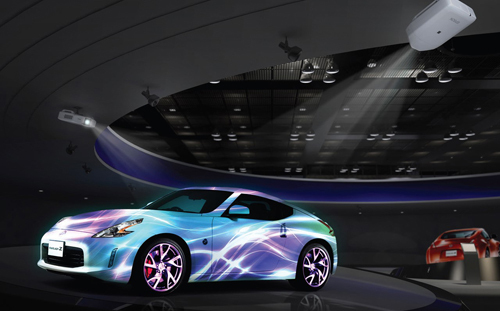 So where is projection mapping gaining the greatest traction? Anywhere that producers or owners want to motivate and energize their customers and audiences. Recent neurological research has shown a direct correlation to light and hormonal activity in the human brain. Lighting, or lack of it, can actually trigger hormonal and other electrical impulses. Seasonal Affective Disorder (SAD) is perhaps the best known direct correlation to the absence of natural sunlight and emotional response. Patients with SAD exhibit prolonged depression during the long, cloudy periods of winter. Meanwhile, studies at the University of Toronto have determined that bright lights intensify emotions. Participants in the study were exposed to various light levels when judging a variety of sensations-such as taste, word choices, and fictional characters. High light levels correlated to heightened responses. Researchers concluded that marketers should make certain that light levels are high when literally spotlighting potentially emotional product purchases, such as jewelry. Dim light is relaxing-the perfect venue for a romantic dinner. Bright light excites the brain on many levels. It's no wonder then that we're attracted to light on many levels and that light has the proven potential to influence our mood and behavior. For these reasons, public venues have used lighting for great effect throughout the ages, from the first lime lights that illuminated early theatrical productions to the multimedia extravaganzas of popular music performances today. Clubs in the Roaring 20s competed for customers with lavish dancefloors sporting light-diffracting chandeliers and mirrors. In the 1960s black lights and morphing, amoebae-shaped light shows pulsed to the sound of psychedelic music. The 1970s brought Saturday Night Fever and a raft of nightclubs sporting disco balls and multicolored panel dancefloors that blinked to the beat of dance music. 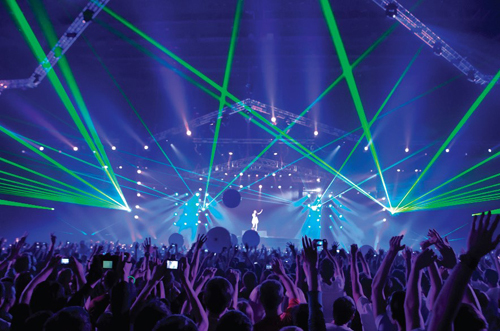 Laser lights were next on stage in the late 1980s and 90s to excite crowds from dance clubs to sports arenas, piercing the air with crisscrossing, multi-colored beams. During the Super Bowl XLIV half-time show, The Who staged the largest outdoor concert production incorporating laser lights. That display was broadcast to over 100 million viewers. Since then, even smaller night clubs have installed laser lights to draw crowds. "[Researchers] asked participants to rate a wide range of things- the spiciness of chicken-wing sauce, the aggressiveness of a fictional character, how attractive someone was, their feelings about specific words, and the taste of two juices-under different lighting conditions. The results: under bright lights emotions are felt more intensely. In the brighter room participants wanted spicier chicken wing sauce, thought the fictional character was more aggressive, found the women more attractive, felt better about positive words and worse about negative words, and drank more of the "favourable" juice and less of the "unfavourable" juice"
Projection mapping is a natural progression in audience engagement through the use of light. Lasers, dancefloors, and other lighting techniques still have their place. But projection mapping can paint entire visual stories and create immersive environments - delivering even additional impact combined with stagecraft lighting effects. While we are all affected and energized by light, storytelling and imagery are also a captivating way to excite crowds, tell a product story, or bring an additional creative dimension to a concert performance. Stories and images provided by large, immersive projected displays add an energy and emotional connection. Projection mapping has revolutionized dance floors, concerts, and live events. Carrie Underwood, during the 55th Grammy Awards, performed live as her dress, as a projection mapping surface, transformed into butterflies, roses, and other brilliant images as she sang "Two Black Cadillacs." "They can do a lot of amazing things with projectors these days," she said backstage, holding her trophy for best country solo performance. "We had a dress especially made. I said I should take that home and we can watch movies on it." Using multiple stacked and linked projectors, video artists can morph virtually any curved, cornered, or irregularly shaped surface, including entire building facades. These are the same techniques producers are using to enliven outdoor events, such as Lyon's "Fête des Lumières," or Festival of Lights, and the PyeongChang Winter Games opening ceremonies. 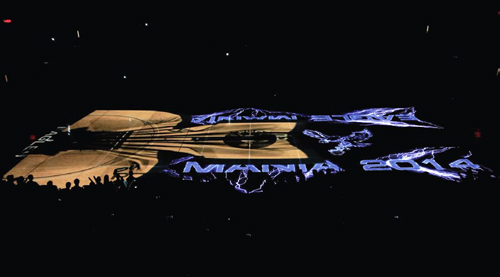 Projection mapping of stadiums boosts crowd energy during pregame and halftime shows. At Pensacola Christian College, producers there developed and staged a full-court projection mapping presentation for its basketball team for one-thirteenth of than the price quoted to them by professional production companies. I heard more than one student say, "I've seen this in the NBA, but I didn't expect it at PCC." Nobody would expect anything like this from a small Christian college. 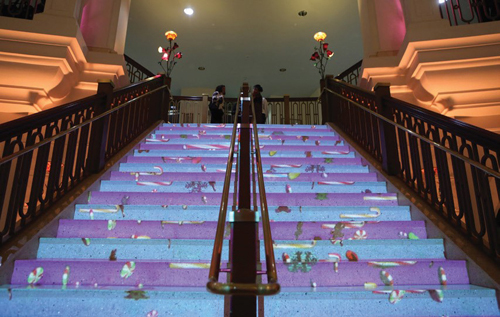 From fund-raisers to product launches, projection mapping bathes familiar objects and environments in a whole new light. Animation, motion, and video draw greater attention, make events more memorable, and create a lasting, positive impression. The good news is that prices have continued to fall for all the essential components for projection mapping while quality has improved, making mapping more affordable than ever. Even reasonably priced laptop PCs and Macs have the power to render, host, and serve up video. Mapping Software: Look for software that will give you ample creative possibilities yet won't break the bank. It's important to find a cross-platform (PC and Mac) software package that allows event producers and/or lighting directors to map video to any type of surface and enables a great deal of creativity and control over how and what is projected. Computer Hardware: Whenever working with video, the better the graphics capabilities the better. Good gaming quality PC laptops with capable graphics cards run around $1,000-1,500. A MacBook Pro with a graphics card upgrade will cost approximately $2,500. Multimedia Content: For beginning producers, it is wise to start out simple: shoot video straight on for the smoothest and least complex mapping. At first, stay away from complex canvasses or surfaces. Animation-both original and rented-can be mixed easily with the mapping software previously mentioned. When mapping, producers should take into account the distance from the projector to the mapped surface, and where the projector should be mounted in the most effective and least intrusive manner. For example, performers on stage prefer that lights and lighting is projected behind them rather that at them: projectors can be mounted on overhead mounts behind the performers at a stage backdrop. Projector: The projector is the heart and soul of any video immersion project. Remember the earlier tips: projection that is closer and aimed dead-on or nearly so produces the clearest, most brilliant images. Epson Pro G and Pro L Series projectors with short-throw lenses can be chained to provide panoramic, edge-blended displays, or stacked for wider and taller immersions over a greater surface. 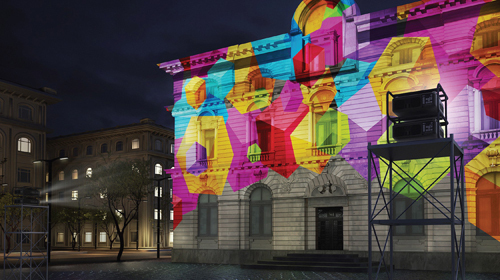 Advance Projection Mapping: Panoramas and Curved Surfaces: With stacked or linked projectors, producers can map larger venues, including the entire façade of a building. Linked, side-by-side projectors can provide wider, more panoramic displays. Meanwhile, mapping software will allow the creative projection of images onto curved surfaces and "bend" images around corners. Using these techniques producers can map everything from large floor spaces to entire buildings. Advanced Projection Mapping: Constructing 3D Surfaces: Beyond flat walls, screens, and ceilings of the venue, projection mapping producers can experiment with projection canvasses made of paper or cloth. Some of the best canvasses to work with are made of a flexible, highly reflective plastic corrugated sheet material. When used with specialized cutting cloth more complex 3D surfaces (canvasses) can be easily modeled, such as snowflakes, pyramids, etc. Producers are bounded only by their imagination and modelling skills. For more information on Epson's complete line of high lumen projectors visit Epson Large Venue Projectors. For more information on pricing or to request a demo, see Epson's Request More Info Form. 1. Jones, Brett. The Illustrated History of Projection Mapping Projection-mapping.org. 2. US National Laboratory of Medicine. EPSON and PowerLite are registered trademarks. All other product and brand names are trademarks and/or registered trademarks of their respective companies. Epson disclaims any and all rights in these marks. Copyright 2018 Epson America, Inc.